PST26-ATHERSH...Sold by the Each. 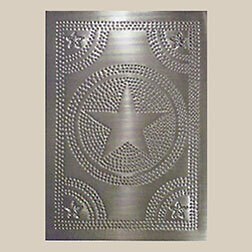 Star Circle Pattern Pie Safe Tin in antique tin finish. 14 x 10 inch High Quality pie safe tin comes with lacquered finish, no peel off plastic. Can be installed vertical or horizontal. If horizontal then you will want to turn the tins in opposites positions for symmetry.